I’m sure that you have all heard about the popularity of the new Netflix show, Tidying up with Marie Kondo. Have you watched it yet, or have you read the book yet? Millions of people are watching it and millions of people are tidying up, but many people are questioning what to do with the stuff they have found that doesn’t spark joy. Should the stuff be tossed it in the trash? Should the stuff be donated? Or, should the stuff be sold to try and make some of our money back? Are you knee deep in tidying up your home and life? Are you having the “what should I do with my stuff” struggle too? 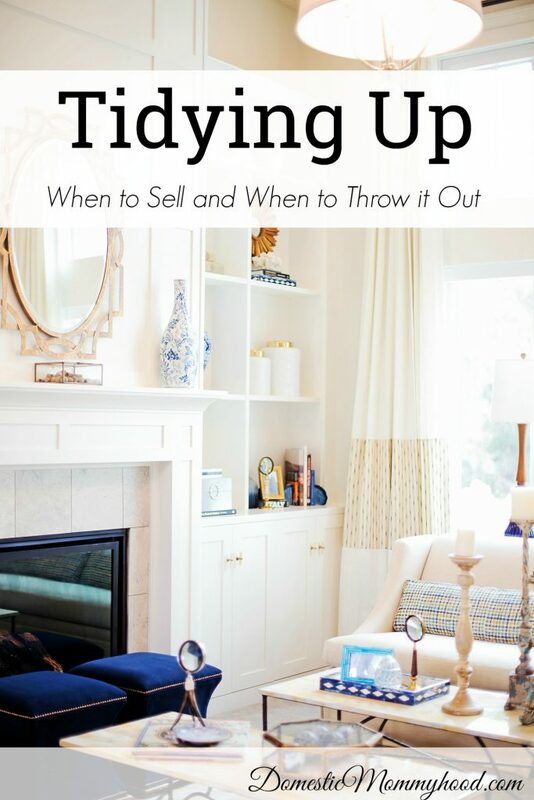 Let’s have a little chat about tidying up and when to sell and when to throw out. This may seem like it should be an easy answer, but the reality is, we want to do the right thing with our items, but we also don’t want to hold onto it for unnecessarily long time. If you aren’t in a huge rush to get your items out of the house, garage, or storage unit, why not sell them? Chances are, you spent a lot of money on them the first time around, why not try and recuperate some of that cash? 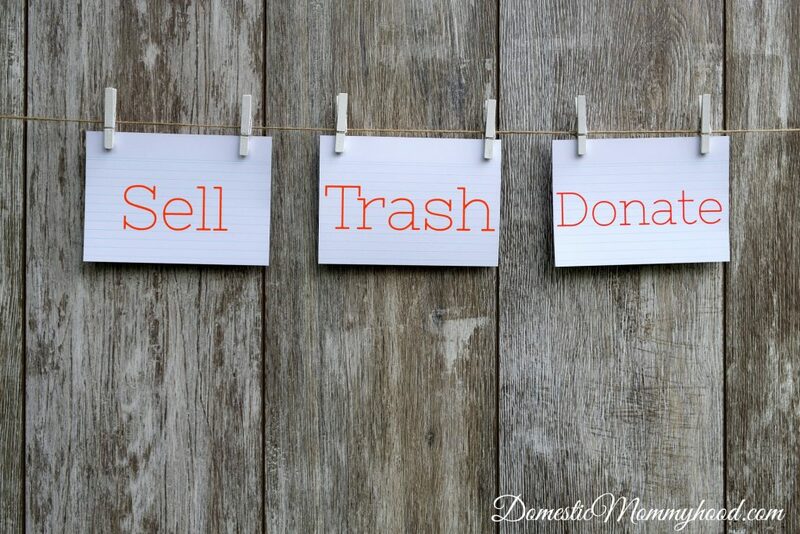 If you have a decent number of things to get rid of, selling your items can go far toward boosting your savings. If the item is in good working order with no stains or damage, and it is something that people are actually buying, then go for it! By this I mean, you might not have much luck selling a VCR, but you could probably get rid of a streaming device. Just make sure your item is relevant. If it is clothing that you are getting rid of, there are a couple of questions that you should ask yourself when you are trying to decide whether to sell or to give away. First of all, is it in good shape? No one wants to buy old, worn out clothing. Next, is it in fashion? You absolutely need to see if the item you are getting rid of is of a current style. It is hard to sell clothing that isn’t within the last 2 year’s fashion styles. Are they name brand? Brands matter in clothing resale. It is actually relatively easy to sell something that is a popular, name brand (think American Eagle, Nike, etc). It is extremely hard, however, to resell clothes that are a Walmart or other store brand, so those tend to be better for donation. Whenever you find an item that is stained, broken, or no longer useable, this is the time to throw it out in the trash. The exception here is electronics. Most communities have at least one electronics recycling center because they do not want those items ending up in landfills. Please dispose of them responsibly. Donate anything and everything that doesn’t fit into the above categories. Do a little bit of research to decide which donation center you wish to you, and donate your items there. You can feel good knowing that your donation can help others, plus your donations may even be tax deductible. Keep in mind that if you are getting rid of baby items during your tidying up, you may find it hard to donate these as many donation centers do not accept them. For this, I suggest contacting a local women’s shelter or local church that has a giving center. Have you begun your tidying up journey? What have you done with the items that don’t spark joy within you?